Dan Carcillo, Scott Hartnell, Sean Avery, Chris Neil; these are all names that will most likely get you a scorn look or maybe even a few verbal jeers for even mentioning in downtown Pittsburgh (or to ANY Pens fan for that matter). These are the dirtiest players in the business and to most they are the guys everyone loves to hate. These 4 automatically come to mind as the front runners of that list, but perhaps they now have some company near the top. Meet Senators defenseman Andy Sutton. While he is most noted for his recent encounters with the Pens, he has a history with the fanbase this season dating back to mid-season. Back when Sutton was still with the Islanders, he had a run-in with Pascal Dupuis. He boarded Dupuis head first into the boards knocking him temporarily unconscious and bloody. Sutton was suspended for a few games afterwards, and there was no serious injury for Dupuis. By April, everyone was expected to put it behind them and move on. Time heals all wounds, right? That is true, but what is also true is that history repeats itself. Friday night Jordan Leopold found himself laying temporarily knocked out on the ice due to an "elbow" from none other than Andy Sutton. It has been a heavily debated topic in hockey as to whether Sutton got his elbow up, with a fair amount of people supporting each side. (Personally, I believe he did catch the bottom of Leopold's chin as well as left his feet before impact, but that is only my opinion.) Sutton had nothing more to say about the incident other than "Are you an expert?" repeatedly to the reporter who asked him about it. This interviewing failure made Sutton a Pittsburgh punchline for the next few days, that is until he struck again. Tuesday night Sutton knocked Pens forward Tyler Kennedy out of the game with a hit that was technically clean, but also a bit unnecessary. Regardless of the technicalities of the hits, that is 3 Penguins and 2 in this series. That is more than enough to expect a constant shower of booing when the Pens and the Senators face off Thursday night at Mellon Arena. 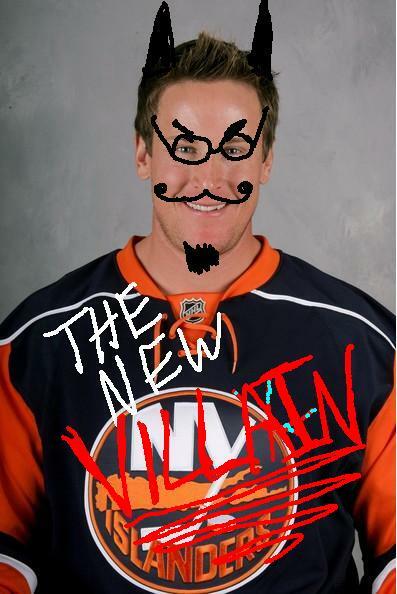 How Sutton will respond to this is still unknown, but what is known is that there is now a new villain in Pittsburgh.